In SprutCAM most 3d milling operations have the <Use fast calculation method> option. The option is found at the Miscellaneous operation parameters tab. If <Use fast calculation method> is used toolpath calculation time reduces dramatically. A speedup on complex parts may reach up to 10-20 times. 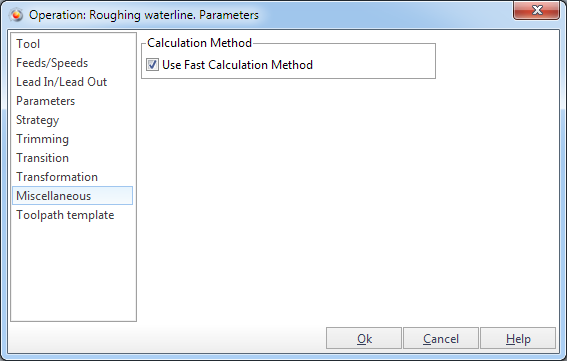 By now fast toolpath calculation methods use triangulated surfaces as input data. This fact involves some limitations that should be taken into consideration while generating toolpath. First of all, the quality of the generated toolpath may be worse than when using traditional exact methods. The maximum deviation of the toolpath depends heavily on the value specified in the <Deviation> panel of the operation parameters dialog. This value determines the tolerance of model triangulation. Secondly, triangulated surfaces require a lot of operation memory. Described limitations are today a common place for all CAM systems, and only SprutCAM gives you the alternative between speed of approximate calculation methods and quality of exact calculation methods.